Aiieee! Run For Your Lives! 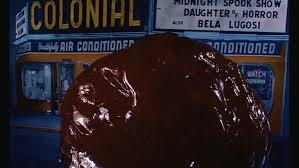 It’s The Blob! The Blob was all set to run amok in the Pioneers and Soldier Memorial Cemetery last week, but its appearance was cancelled due to rain. Hey, you didn’t think it was gone for good, did you? The Blob is back on Wednesday, September 17! It creeps, it oozes, it’s hungry for human flesh! Steve McQueen and his fellow teenagers are the only ones who can stop it. But how? This movie is great fun, an almost archetypal sci-fi movie from the 50’s. The weather is going to be perfect, and best of all this screening benefits our special venue, the Pioneers and Soldier Memorial Cemetery (it’s the cemetery at the corner of Lake and Cedar in Minneapolis). The gates open at 5:30 pm and the show begins at dusk. Can you witness the horror of The Blob without covering your eyes? Let’s find out! You can purchase tickets here.